WELLSVILLE — A new artificial turf and all-weather track at Nicholson Stadium will become a reality by next football season after approval Monday by the Wellsville school board. The board picked J.T. 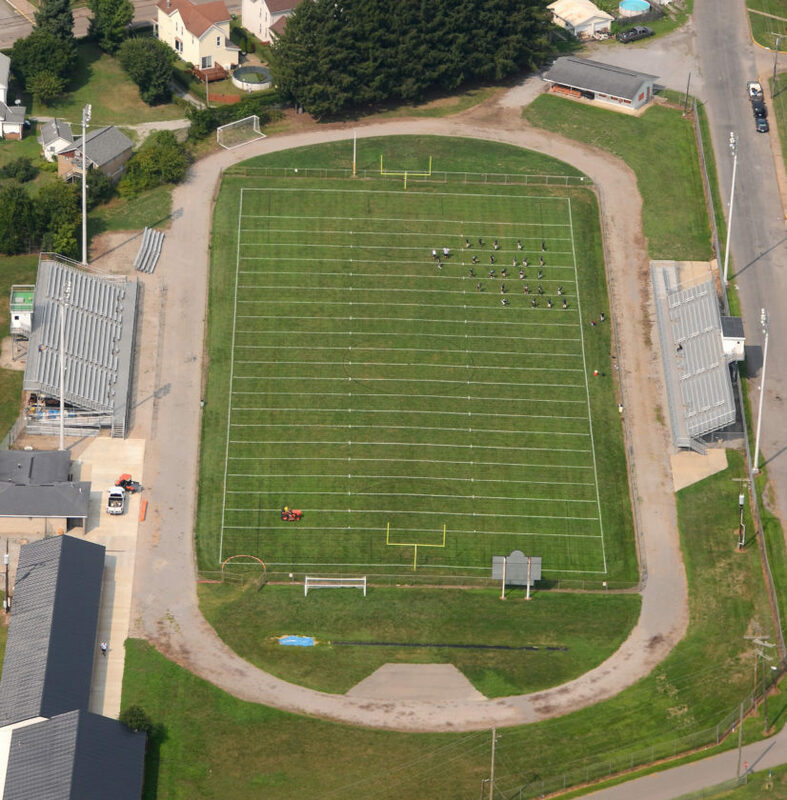 Sauer and Associates of Burgettstown, Pa., to provide design services for the stadium’s track and field renovations for $48,840, and entered into a contract with Dallis Dawson and Associates of East Liverpool for professional surveying services inside the stadium for the football field along with adjacent practice field for $13,960. James Sauer, RLA, principal of the Burgettstown-based firm also doing business as JTSA Sports, spoke before the board about some of the remodeling plans, which he said is expected to be completed by the start of the next football season. Along with the installation of the new artificial turf field, Sauer said that the adjacent practice field will also be redone, which will include moving the ground from the current playing field to the practice field. “If we have to take that earth somewhere to a distance, it’s going to elevate our costs, so if we can take that directly within 300 feet and we can lay that down, spread it and seed it out, we have an opportunity to do two facilities for the price of one,” Sauer said. Board president Gary Althiser said he has spoken with residents in the district, and while the community is generally looking forward to the renovations, some have had concerns about the safety of the artificial turf, some with the idea of artificial turf formerly used decades ago. “A lot of them are still thinking about the 1980s, with the porch carpet pulled over cement, and it’s just all that they know about,” Althiser said. Acknowledging that synthetic turf has evolved greatly over the decades, Sauer said that today’s synthetic turf is done with polyethylene and polypropylene materials, which is eventually woven into a backing similar to carpet. The carpet is then laid above a dynamic drain system, to allow water to flow and becomes environmentally friendly. Inside of that includes a small amount of sand used as a balance and filled with a rubber pellet system. Sauer said that the product has been tested multiple times and has been proven to be safe while also providing energy improvements, which he said will be inspected yearly. Sauer said that JTSA Sports has been involved in upgrading stadiums on various levels throughout the past 15 years, including Brooke High School in West Virginia, West Liberty University, Mountaineer Field at Milan Puskar Stadium at West Virginia University and as far east as schools in Baltimore County in Maryland and Washington, D.C.
Sauer said that the firm will oversee the project and select vendors to help the district, while also working with state and federal officials in order to stay in regulation with construction and storm water management. “As we move forward into this project, there’s going to be a lot of companies that are going to come forward, including turf vendors, track and field vendors and specialty contractors,” Sauer said. First discussed during its October meeting, district officials looked to make improvements to the stadium to make it community-friendly and to provide a venue for its track team to practice and race while staying in village limits. In its current state, the stadium does not have a suitable track for the Wellsville track team to use for practices, as the “track” is gravel and considered unsuitable for meets. Last month, Superintendent Richard Bereschik said the goal is to get a track with at least six lanes, which would also open the possibility in future seasons for Wellsville to host track meets. The track can also be used for walkers and runners in the village during daylight hours. The move to artificial turf will make Wellsville just the fourth district in the county to use the artificial playing surface. East Palestine, Southern Local and Salem are the other three schools in the county whose home fields (Reid Memorial Stadium, Indian Stadium and Reilly Stadium, respectively) also use artificial turf. Some of the funds for the improvements are expected to come from advanced money per the district’s agreement made earlier this year with Advanced Power in relation to the construction of the South Field Energy plant, to be located off Hibbetts Mill Road in Yellow Creek Township. Both resolutions were approved, 4-0, with board member Austin Dalrymple absent. Copyright © Wellsville Local Schools 2019. All rights reserved.